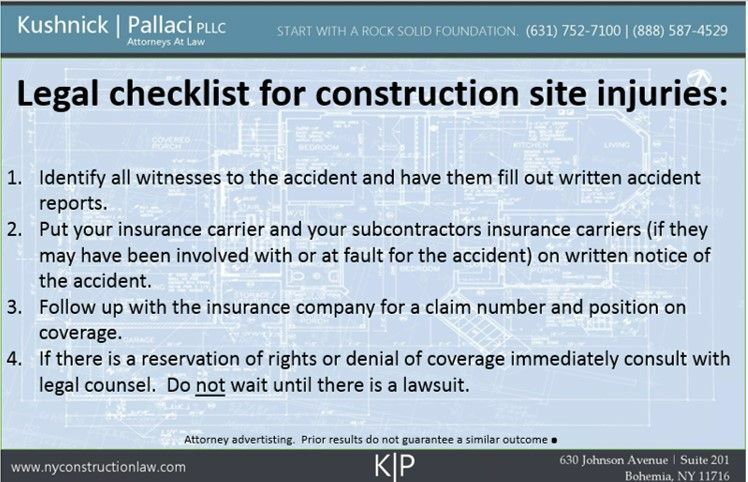 It is a good practice to have all witnesses to the construction accident fill out accident reports. Get basic contact information for the witness and have them put a statement in writing. A copy of the accident report should be kept on file for at least three years after the injury. You bought that insurance policy for a reason – now its time to pull it out and put it to use. If you don’t have a copy, contact your broker or insurer directly. Every policy has a notice section, look at it and make sure that you comply with it exactly as written. Notice should always be in writing and at least one copy of the letter should be sent via certified mail or any other means that allows you to confirm receipt. Notice is a very important aspect of submitting a claim to your insurer so, when possible, have your attorney or broker submit the claim for you. Do not wait until you are served with a lawsuit to put your insurance carrier on notice. Notice to your insurance should happen within a few days of the injury. After you send the written notice to the insurance carrier, follow up with a phone call in about 7 days. Confirm that the carrier has received the notice of claim and try to get your claim number. Write the claim number down and the name of the person that you spoke to. If a claims examiner or adjuster has been assigned, get that person’s contact information and write it down. You should keep this information in a file with your accident reports and the initial notice to your insurance carrier. If you used subcontractors on the project then there is a good chance that you had each of them agree to defend and indemnify you in their contract – at least you should have done so. Pull out the information you have, including any certificates of insurance, and put the subcontractors insurers on notice of the accident too. Don’t just assume that the subcontractors will notify their own insurers and, even if they do, that may not necessarily be proper notice for a potential claim against you so it doesn’t protect you. If no claim has been made against you, your insurance carrier may not take a position with regards to whether there will be coverage. However, if a claim is made against you, your insurance carrier will send you a letter outlining its position on coverage. Anything that they send to you should be kept in a safe place for at least 3 years from the time of the injury. Request that your insurance carrier confirm all coverage matters in writing. You may be served with a summons and complaint or you may just get a letter from an attorney advising that a claim is going to be filed against you. In either scenario, immediately notify your insurance carrier in writing (even if you already put them on notice of the injury). Again, follow up in 7 days as is set forth above. At this stage, it is strongly recommended that you consult with an attorney. Once you get the letter, read it carefully. It is a good idea to have your attorney or broker read it over. If the letter accepts the claim and the insurance carrier agrees to defend you, simply follow their instructions. Your insurance carrier will assign you defense counsel and pay them directly. Cooperate with your insurer and defense counsel in handling the case. If the coverage letter does not accept coverage, immediately advise your broker and at that point it is strongly advisable to speak to an attorney about challenging the denial of coverage. What if My Carrier “Reserves Its Rights”? Sometimes insurance companies will make a “reservation of rights.” Basically that means that they are going to defend you for the time being but that they reserve the right to withdraw at any time if it is determined that it is not a covered loss. If your insurance company takes this position, you should immediately consult an attorney. Under New York law, you have the right to chose your own defense counsel (as opposed to accepting counsel appointed by your insurance carrier) at your insurance carrier’s cost. Construction site injuries must be addressed quickly and promptly. Simply hoping that it will “go away” is not the solution. While you may be concerned that reporting an injury is going to increase your premiums, the costs are far less than those that you will incur in defending a lawsuit and possibly paying a judgment against you. 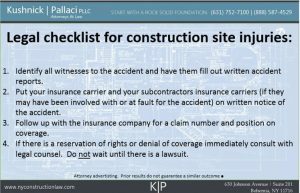 New York’s Labor Law makes owners or commercial properties and general contractors strictly liable for construction site injuries with very few exceptions. With such devastating results possible, it is recommended that you review all of your contracts and your insurance policy with an attorney and make sure that you have done everything possible to protect your business. This entry was posted in Construction Safety, Defective Construction, Injury, OSHA and tagged Accidents, certificate of insurance, construction site injury, injury, Insurance, Insurance Claims by admin. Bookmark the permalink.